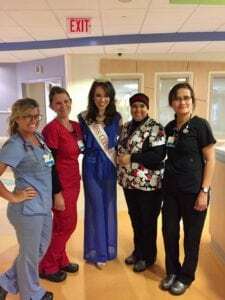 Olivia Michael first learned about CMN Hospitals through her involvement in the Miss America Organization. 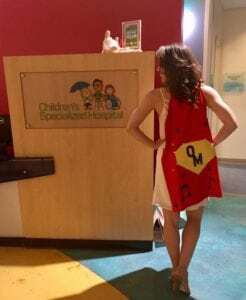 Olivia poses with her Superhero Cape made at one of her famous Craft Nights! 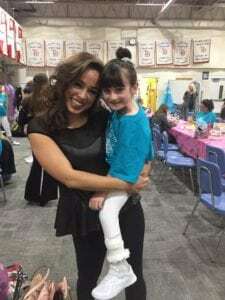 Taryn had the opportunity to walk on stage at the Miss New Jersey state pageant twice as Olivia’s Little Star, a part of the Miss America Star Princess Program. Additionally, Taryn participates in the Precious Gems Pageant with Olivia as her mentor. Olivia has dedicated countless hours to fundraising and volunteering with Children’s Specialized Hospital. 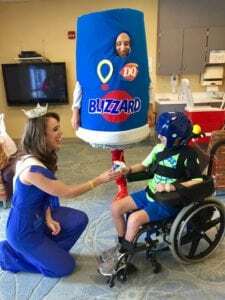 She has hosted multiple Craft Nights for our patients, has collected craft supplies to give to our patients, and helped to hand out Blizzards on Miracle Treat Day 2017 with Josh Sundquist! Thank you, Olivia, for all you do to support our patients and the hospital! Previous post: Blog Takeover by Burton!